As we have had a little warm spell and the snow was melting yesterday. 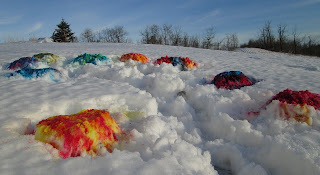 I thought I would snow dye some fabric. 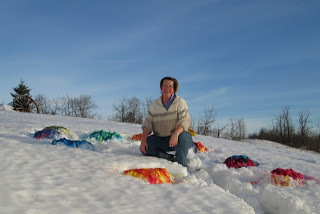 I also got the timer to work and took a photo of myself knelling by the fabric. It was sunny and warm yesterday, just look at the great blue sky we had. No sun today just grey. I hope this one turns out. I placed the fabric with a spin and have laid out the fabric with a plaid like pattern. I am off the wash the nine pieces out now. I have added this to Freshly Pieced WIP Wednesday and Needle and Thread Network WIP Wednesday. Love the idea of just making piles in the snow and bypassing dishes and pans. Will be very curious to see your results! I tried last week and realize now my snow was too dry (as strange as that sounds, it does make sense! lol). This looks like lots of fun!! Interesting. I put my prepped fabric in the bottom of plastic tubs, fill the tubs with snow, and pour on the dye. Then they are indoors to 'cure'. Never tried it right on the snow! How interesting. 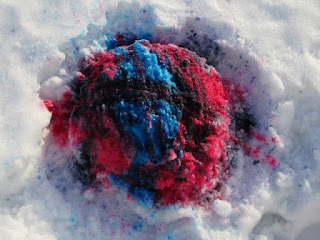 We have no snow in S. Louisiana, ever, but it is something I would like to try. Can you send some snow this way? Very neat! I so want to do this. I love that orange fabric! I will check back for the final result! How cool is that? I have never heard of snow dyeing fabric. Wonderful way to take advantage of our great Canadian winters! I would love to see the result. your snow dying pictures are hilarious. You make your community very happy (and colourfull!) Great work Cathy.